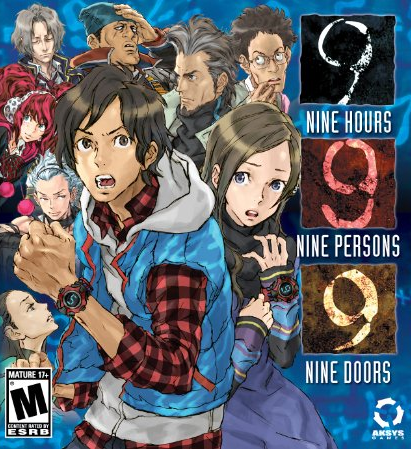 9 Hours 9 Persons 9 Doors is a visual novel published by Aksys Games available on Nintendo DS. As a visual novel, the game is heavily story centered and has quite a gripping and intriguing plot. Expect to lose sleep if you enjoy mystery and who-done-it style narratives. The story centers around 9 different people, all connected in some mysterious way; these people have been kidnapped by an individual wearing a gas mask. They wake up and find themselves trapped on a slowly sinking ship wearing a peculiar watch which bears a single digit unique to them. They have been captured by Zero, who forces them to take part in a game not entirely different to something found in the Saw franchise. If they break Zero’s rules, a miniature bomb will go off…in their stomachs. In order to escape, they must find numbered doors with the one marked 9 as their ultimate goal. The story is broken up into multiple parts, each requiring a separate play through in order to view. Once you play through the game at least once, the game allows you to skip any text you’ve already read and grays out choices you’ve already made. This mechanic allows players to reach the other endings without worry over taking the same path twice. You are unable however to skip puzzles that you’ve already beaten. This means if you want to jump right into the story or a puzzle you’ve never seen before, you will need to complete them again. The story itself is quite well written with interesting characters driving the plot, such as Clover, who becomes a very interesting and sympathetic character, depending on which path you take. Unfortunately, the characters do suffer from some clichés: Lotus for example is the token buxom beauty blessed by nature and Junpei is the naïve yet good natured and likeable protagonist. The characters do grow on you and you’ll probably find a favorite among them. I personally liked Santa who comes across as the anti-hero type. There is no voice acting in this game but that can be a blessing in disguise. For a game that relies on its story and characters, a terrible voice actor could be enough to ruin the whole experience. a small sample of the narrative. There are many twists and turns throughout this novel, with a shocking- if somewhat slightly convoluted- true ending. In order to get the true ending you have to jump through a hoop or two that the game doesn’t tell you about. Aksys games (through their website) have allowed fans to send questions to the developers regarding aspects of the plot they didn’t understand. Because this game isn’t very new, however, the deadline to do so has passed. It’s quite likely that your question has been asked by someone else though; once you complete the true ending it is recommended to visit the website (listed as a source) and see if your questions have been answered. This helps fills in any plot holes that you might find or questions you might have. While it’s difficult to find any story without some holes, the plot of 999 is very satisfying and will keep you engaged well enough to reach its conclusion. In order to pass through numbered doors which lead to the exit, the 9 people need to work together and create a digital root that equals the number on the door with their watches. The digital root is the sum of all the numbers involved. An example would be 5+7=12, 1+2=3. 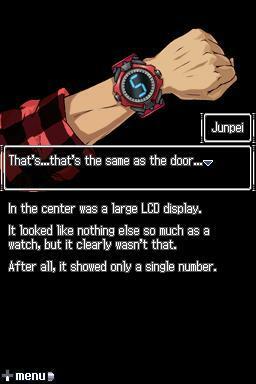 So if a door has the number 3 on it, the people with the 5 and 7 watches will be able to enter. The digital root is also an important part of gameplay, and the game does provide a calculator. Once the party is passed through the door they become trapped in a room. They must than find and use various tools to help them escape. 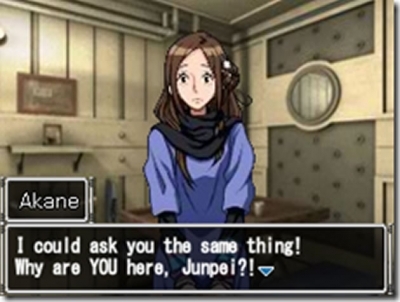 The gameplay portion of the visual novel is highly reminiscent of the ‘escape the room’ flash games found on the internet. In 999 you can click just about any item you come across, however only items useful to your endeavor will be added to your inventory. There are no red hearings in the game. There is no pixel hunting as items you click on are fairly easy to see. Most puzzles require combining other items together to create a new item or clue that will solve your problem. You may need to fill a vase with water to put out a fire to get another item, for example. The solution to most puzzles is not mind numbingly obscure or embarrassingly easy though. It’s quite fulfilling to solve a puzzle in the game. If you are unable to finish a puzzle and want to continue the story, though, it may be slightly aggravating because the story is the main focus. The graphics are all two dimensional outside the ability to look at items up close in 3D. In some instances the game tells you something rather than shows it to you. The first death in the game is told in shockingly horrific detail. This lets your imagination conjure the grizzly scene itself. Some things within the game would have benefited from stronger hardware; such as flowing water that when viewed in game appears to be frozen solid. The music is atmospheric and does a great job of relaying emotion to the player. If you’re a person who enjoys a game fullest due to its story and doesn’t mind a few annoyances, such as the qualifications to view the true ending, then you would do well to get this game.